Have you been stuck inside with annoying family members and no electricity? Tired of chips and fattening snacks, and ready to rejoin civilization? Well, don't worry, we've got you covered - here's a list of several Bay area eateries that are open and ready to serve up some grub! Looking for a quick, hot meal? Sonny's BBQ on Dale Mabry is open, as well as the McDonald's on Kennedy. International Plaza and Bay Street re-opened on Tuesday morning at 10 am for all of your high-end dining needs. South Tampa's Publixes are all open now - run down there and get your Pub-Subs, more beer, and some meat to throw on the grill. All local Wawas will also be open as of Tuesday morning; although if you need gas, you may want to call your local Wawas to make sure - some stores are still reporting being out. Gengiz Khan on Bay to Bay is open, as well as Love's Artifacts Bar & Grill and Elmer's Sports Cafe on South MacDill Avenue. Need a Chinese food fix? China City in Tampa Palms is open for in-store orders only; China One on Bruce B Downs, and New China on Waters Avenue are both also serving. 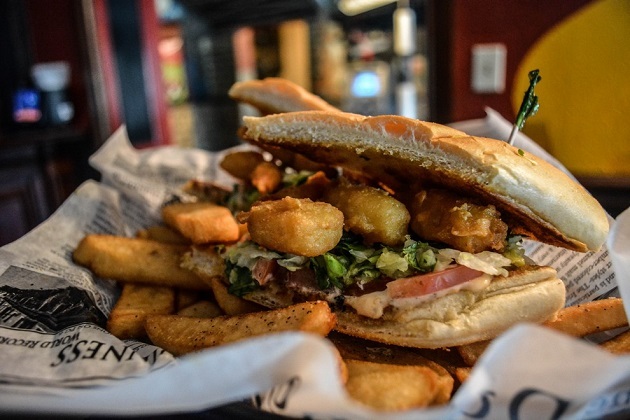 The Tampa Tap Room on North Dale Mabry can satisfy your cravings for delicious wings and other traditional bar foods, as well as an ice cold pint (and who in Tampa doesn't need an ice cold adult beverage right now? It's been a stressful few days!). For that artisanal pizza fix, Cappy's Pizzeria on North Florida in Seminole Heights will be open as of 5 pm today. Burger Monger, Beef 'O' Brady's and the Smoothie King on Dale Mabry on North Dale Mabry are also all open for business. WaterWorks Bar and Grille in Downtown Tampa has a scrumptious dinner buffet starting at 4pm. Sometimes you just need some fried chicken - I completely get that - so head on over to Popeyes Louisiana Kitchen South Kings or Zaxby's Valrico on State Road 60. Personally, I am craving a giant steak and a baked potato - good thing LongHorn Steakhouse Brandon on Causeway Boulevard will be open this evening at 5 pm. Five Guys Riverview at the Winthrop Town Centre is dishing up gigantic burgers, but if you're in search of something healthier, the Brandon Panera Bread store is now serving fresh soups and salads. Ready to enjoy a hot meal after Hurrican Irma? Restaurants and shops are starting to open up and resume business. If we missed someone, let us know and we'll add it to our list. Wherever you go, stay safe out there - safety crews are working hard to restore power and get all of Tampa Bay up and running again!